Organised at LPU campus, this workshop of project ‘Disha’ saw participation of more than 80 schools from Haryana, Himachal Pradesh, UT Chandigarh & Punjab. About 130 Principals, Heads & PGTs, from Kendriya Vidyalayas, Jawahar Navodaya Vidyalayas, Adarsh Sr Sec & other reputed schools participated. 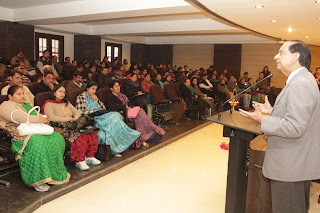 During this, LPU experts held various important technical sessions and Panel Discussion towards Sharing challenges and innovations in School & Higher Education and bridging gap between the both, Hands on Exercise-Emails, Blogs and Personal Web Pages, e-Learning concepts and lab work, Role of ICT (Information and Communication Technologies in Educational Institutions), Communication Skills, Managing Work Life. Visiting educators also underwent interactions with senior functionaries of LPU, feedbacks and open forum for discussions and recreational activities. On both the days of the workshop, the teachers of distant places had been provided with suitable lodging, boarding, food and other facilities. It is extremely taboo in love is not sincere. Of course there are things that we are entitled to keep as a secret for myself, not necessarily share all the enemy. But do not say it does not mean to lie to avoid going to cover something. Because when he found out the truth, to make sure the confidence of the relationship will be more or less shaken.